Buried treasure, sharks, kid detectives — and it all takes place on Martha's Vineyard. Secrets from the Deep (The Devlin Quick Mysteries) by Linda Fairstein, Dial Books, 2018, 280 pages, $16.99. Secrets from the Deep is the third installment of international bestselling author Linda Fairstein’s Young Adult mystery series (following 2016’s Into the Lion’s Den and 2017’s Digging for Trouble). The book opens with her 12-year-old amateur detective Devlin Quick, her best friend Booker Dibble, and Booker’s eight-year-old cousin Zee all hitting Inkwell Beach at Oak Bluffs early in the day, even before the lifeguard has arrived. Devlin, a confident swimmer, is wading out, while cautious Booker hangs back, worried about a possible riptide. The three kids aren’t there to swim, however. Devlin is intent on harvesting a deep pail of seawater, wet sand, and, with any luck, “snails and crabs and critters” that can then be analyzed as part of a school project. Devlin is staying at the Booker family’s Vineyard home as the summer ends, but she’s expected back at school with water samples, and the more exotic those samples are, the better. Thinking a swimmer named Gertie is in trouble, Devlin heads toward the water. However, the Gertie is actually a 15-foot great white shark swimming right offshore. Luckily, Devlin is saved from a potentially catastrophic mistake at the last minute. Zee, it turns out, is a shark fanatic, who actually named Gertie the shark while working with the oceanographic institute. “Gertie Thaw” was the girlfriend of legendary 16th century pirate Lemuel Kyd, who buried some of his treasure on the Vineyard. In addition to sharks, treasure comes into the story right away, since one of the things that Devlin scoops out of the wet sand is a Spanish doubloon. And just like that, in a matter of pages, the plot of Secrets from the Deep is off and running. Fairstein smoothly weaves a first-rate historical tale of piracy and plunder with modern-day intrigue in the world of rare coins. The book’s three young protagonists make an effective trio: Zee providing copious amounts of helpful exposition, Booker providing the voice of balanced reason, and Devlin acting throughout as the kind of brave, whip-smart, and slightly sarcastic heroine Fairstein’s many fans will recognize from her long-running Alexandra Cooper series. 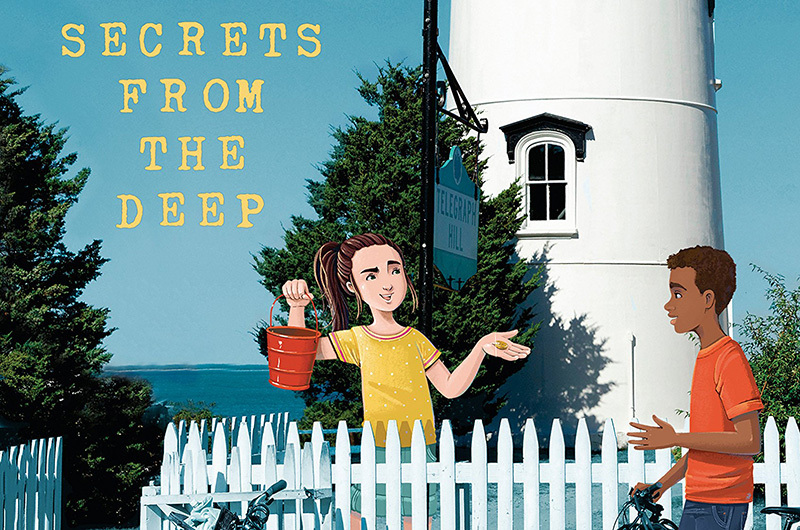 Secrets from the Deep wonderfully continues a breezy, engaging series that gives readers a different slice of this author’s writing world. And this particular volume will remind Fairstein’s adult Vineyard readers that their Island home has a long and sometimes shady past.